Lady Gaga has endorsed Oprah Winfrey for President after the star’s stunning speech at the Golden Globes. 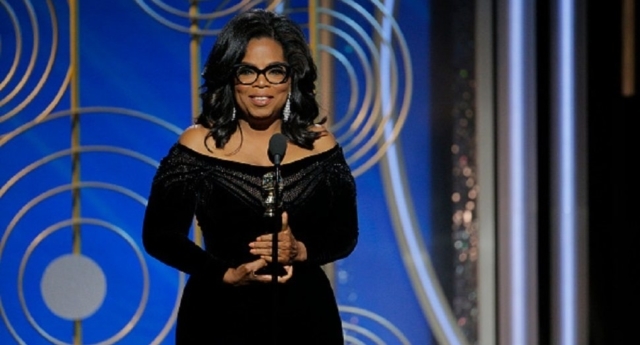 There are reports that Oprah is ‘actively thinking’ about running in 2020 after her speech on gender equality prompted a standing ovation. In response to the incredible speech, Lady Gaga tweeted: “Oprah for President? She’s got my vote”. One fan endorsed both women, writing: “YOU FOR VICE? MY VOTE FOR SURE”. “Why? Is the bar really so low that we no longer expect any governing experience? “We can do better, and there are plenty of qualified dem candidates out there!”, one person wrote. There was one endorsement of Oprah’s speech which came from a more unlikely source. “Just saw @Oprah’s empowering & inspiring speech at last night’s #GoldenGlobes. Let’s all come together, women & men, & say #TIMESUP! #United,” Ivanka Trump tweeted. That’s right, President Donald Trump’s daughter. Ivanka has been slammed for her hypocritical tweets in the past. The clapback didn’t stop there. Alyssa Milano, co-founder of Time’s Up, the legal defence fund and campaign set up to combat sexual harassment, responded to Ivanka on Twitter. “Great! You can make a lofty donation to the Time’s Up Legal Defence Fund that is available to support your father’s accusers,” she said. The Twitter exchanges have opened up a wider debate on the cult of celebrity versus political experience. With businessman-turned-TV celebrity Trump becoming an anti-LGBT President, some have concerns over celebrities being pitched as holders of political office. “An understanding of the structure of our political system is important, though,” one person wrote. “Even Raegan was governor before he became president. I think we’ve learned our lesson about electing someone who has no idea how the system works,” one person said. Another person agreed, writing: “Yes. And it’s a false choice that we must choose between experience and good leadership. “There are people with both,” they added. The debate comes after Kid Rock announced his plans to run for political office during an anti-LGBT rant. He then retracted his bid, claiming that it had all been a joke. Kanye West and The Rock Johnson are just a couple of the other celebrities who have been the subject of speculation that they might run for President in 2020.